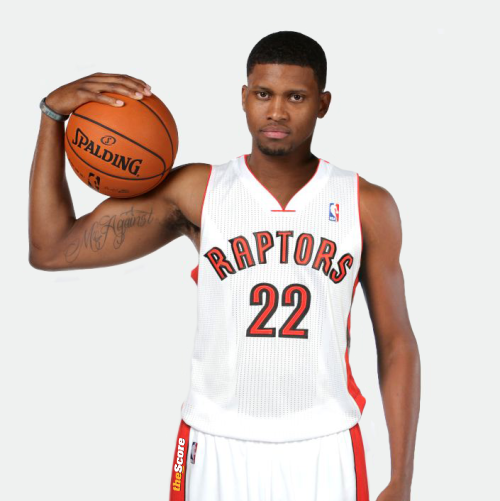 The Grizzlies, Raptors and Pistons agreed to a six-player trade Wednesday that sent star swingman Rudy Gay to Toronto. The Grizzlies, in the midst of a money-motivated makeover, acquired forward Ed Davis and veteran guard Jose Calderon in the deal that also sent backup center Hamed Haddadi to the Raptors. Memphis then shipped Calderon to Detroit for Austin Daye and Tayshaun Prince. The Grizzlies also received a 2013 second-round pick from Toronto as part of the deal. I actually like this trade for all three teams involved. The Toronto Raptors weakest position was small-forward and they were also lacking a star-caliber player, which is a major reason why they have lost so many close games this season. Gay fills that void. It's not inconceivable that Gay could average over 20 points per game on good efficiency for the Raptors as their number one option on offense. His presence should also make things easier for fellow swing-man DeMar DeRozan, who has struggled somewhat with defenses keying in on him all season. He should have much more breathing room to operate now with Gay drawing attention on the opposite wing. Additionally this trade allows Kyle Lowry to start for the Raptors with the departure of Jose Calderon from the team. Lowry and Gay are good friends and also have some chemistry playing together from when Kyle was back in Memphis, so that should be an interesting and positive dynamic for the Raptors moving forward. Obviously, the big question is whether or not this makes the Toronto Raptors playoff contenders, and the answer to that is "no". Not only is it extremely unlikely that they can turn around their 16-30 season and sneak into the playoffs, but even with Gay there the team is still relatively devoid of star talent. That being said, GM Bryan Colangelo has reportedly been shopping Andrea Bargnani, and perhaps he could be packaged with additional assets to make another move for Toronto. Memphis was clearly looking to make a salary-cutting move here, that's no secret. They now have the much lighter contracts of Tayshaun Prince, Ed Davis and Austin Daye to manage rather than Gay's nearly 40 million owed over the next two years. That being said, this move basically eliminates the team from championship contention. Rudy Gay was the only dynamic wing player on the team capable of creating his own shot, and that's something that has proven to be extremely valuable over the years for any NBA trying to seriously contend for a championship. Name one championship team since the turn of the century that lacked a wing player or guard capable of creating his own points off the bounce in clutch situations. I'll wait. Of course, Tayshaun Prince should provide good defense and spacing at the small forward spot, while Ed Davis will excel for the Grizzlies off the bench at both frontcourt spots, but this team no longer looks like one capable of making any sort of deep playoff run. Such is the way of the NBA's new stricter luxury-tax. It was supposed to prevent the monopoly of star players in large markets, but judging from OKC and now Memphis it appears that it only serves to cripple smaller market franchises. The Pistons easily made out the best in this deal, considering they gave up the least for the most in return. They were able to dump Tayshaun Prince's contract (who is due $15 million over the next two years) while bringing in a veteran point guard in Jose Calderon who understands how to run an efficient offense. Calderon is one of the premiere pick and roll point guards in the league, and has consistently portrayed an ability to get his teammates involved and get them easy baskets; particularly big-men. Now Detroit can move Brandon Knight to either the off-guard position or a sixth man role, to which his skills are more suited. Jose Calderon will do an excellent job of getting the most out of Pistons' bigs Greg Monroe and Andre Drummond, and could perhaps even push the team into the playoffs with both the Celtics and seemingly over-hyped Philadelphia 76ers reeling.